overwhelmed by your diagnosis of prediabetes or diabetes? baffled about what to eat…or not to eat? alarmed by all the prospect of taking insulin? scared about having or developing complications? 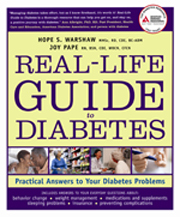 Real-Life Guide to Diabetes, published by American Diabetes Association and written with Hope’s nurse practitioner, certified diabetes educator co-author Joy Pape, puts everything you need to know about managing type 2, type 1 or prediabetes into a one-of-a-kind one-stop book. The 300 colorful easy-to-read pages of Real-Life Guide to Diabetes are filled with key research studies, common myths and facts, and straightforward answers to common questions. Pages are also loaded with practical tips and tactics to solve some of those common real life everyday issues of the 24/7/365 life with diabetes. One of the many ways Real-Life Guide to Diabetes is unique and different is that it helps you learn how to fit diabetes into your real life, your way. The book doesn’t suggest you need to change your life to manage diabetes. "“Real Life Guide to Diabetes...chock full colorful images, highlighted quotes and pop-out boxes to grab your attention in bunches of little "content bites." The authors happen to be two of my favorite figures in the diabetes community: certified diabetes educators with loads of experience and personal passion..."
"“Real Life Guide to Diabetes…is a simple-to-read, all encompassing guide to living with diabetes, both type 1 and type 2…The book is filled with colorful photos and graphics which help explain each topic. Highly Recommended." "Great new fresh approach to an old problem. “Real Life Guide to Diabetes is a must read for those with diabetes. Hope and Joy are the perfect names for authors who give hope and restore joy to with diabetes."